Household lightbulbs give off a chaotic torrent of energy, as trillions of miniscule light particles—called photons—reflect and scatter in all directions. Quantum light sources, on the other hand, are like light guns that fire single photons one by one, each time they are triggered, enabling them to carry hack-proof digital information—technology attractive to industries such as finance and defense. Now, researchers at Stevens Institute of Technology and Columbia University have developed a scalable method for creating large numbers of these quantum light sources on a chip with unprecedented precision that not only could pave the way for the development of unbreakable cryptographic systems but also quantum computers that can perform complex calculations in seconds that would take normal computers years to finish. The work, to be reported in the Oct. 29 advance online issue of Nature Nanotechnology, describes a new method for creating quantum light sources on demand in any desired location on a chip, by stretching an atom-thin film of semiconducting material over nanocubes made of gold. Like taut cling-wrap, the film stretches over the corners of the nanocubes, imprinting defined locations where single-photon emitters form. Past research has tested methods for producing quantum emitters in defined locations, but these designs were not scalable or efficient at triggering single photons frequently enough to be practically useful. Strauf and his team changed all that by becoming the first to combine spatial control and scalability with the ability to efficiently emit photons on demand. 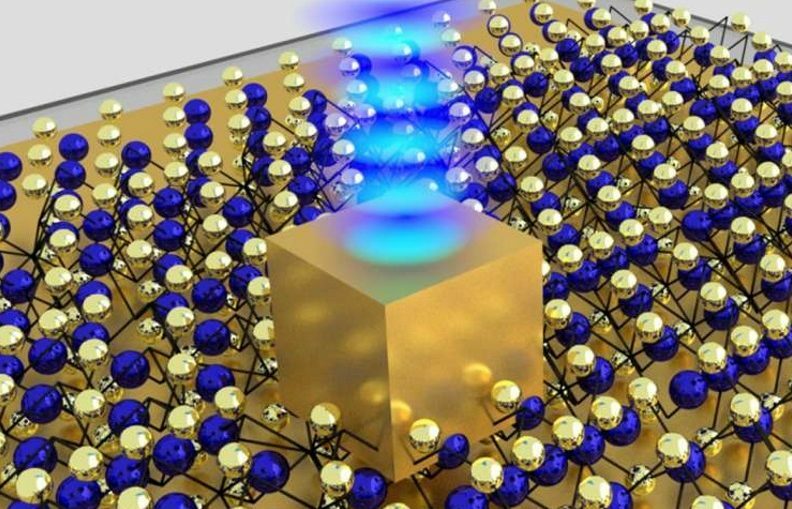 To achieve these capabilities, Strauf’s team designed a unique approach where the gold nanocube serves a dual purpose: it imprints the quantum emitter on the chip and it acts as an antenna around it. By creating the quantum emitters in between the gold nanocube and mirror, Strauf left a five-nanometer narrow gap—20,000 times smaller than the width of a sheet of paper. To further improve the efficiency of the quantum light sources, Strauf teamed up with Katayun Barmak and James Hone, of Columbia University, who developed a technique for growing semiconductor crystals that are nearly free of defects. Using these unique crystals, Stevens’ graduate student Yue Luo built rows of quantum emitters on a chip by stretching the atom-thin material over the nanocubes. The nanoantennas are formed by attaching the mirror, on the bottom side of the nanocube. The result: a record-high firing of 42 million single photons per second; in other words, every second trigger created a photon on demand, compared to only one in 100 triggers previously. This article was originally published by PHYS.